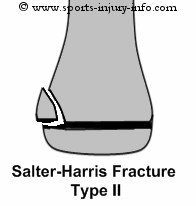 What is a Salter Harris Fracture? 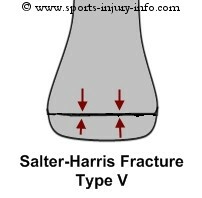 A Salter Harris Fracture is a fracture of the growth plate of the bone. This type of fracture is usually seen in younger people who are still growing. A growth plate fracture can be a serious injury if not treated correctly. Below you will find more information about the different types of Salter Harris fractures, as well as appropriate treatment options. Each of the bones in your body is divided into several different parts. The metaphysis, the physis, and the epiphysis. 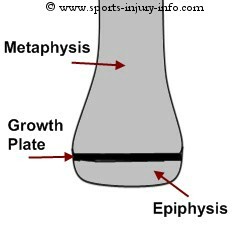 The growth plate is the area of bone between the metaphysis and the epiphysis, and this is where the bone is actively growing, making it longer. When I explain bone structure to my patients, I tell them to think of the bone like an Oreo cookie. You have the top cookie (metaphysis), the bottom cookie (epiphysis), and the creamy middle (growth plate). 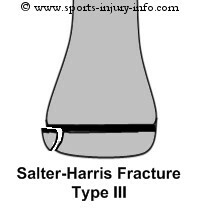 Salter Harris fractures can occur to either the top or bottom part of the bones, or both. Type I growth plate fractures involve a fracture through the growth plate. Imagine taking the oreo cookie and seperating the top and bottom halves. This type of fracture may not be visible on an X-ray, and usually doesn't cause any growth problems. Treatment usually consists of immobilization for a period of time, 4-6 weeks. 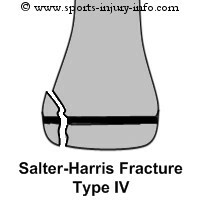 This is the most common type of Salter Harris fracture. A type II fracture involves a break in the bone through the metaphysis and extending into the growth plate. So, in the Oreo example, imagine breaking off part of the top cookie. Type II fractures usually do not cause growth problems, and are treated with immobilization. It is important that the fracture be aligned correctly in order to heal properly. Type three fractures extend through the epiphysis into the growth plate. This type of fracture is more likely to cause growth problems because of the involvement of the epiphysis and the disruption of the growth plate. They may also require surgical intervention in order to re-align the bones for optimal recovery. This Salter Harris Fracture extends through both the metaphysis and the epiphysis. Imagine breking your Oreo cookie in two. Long term disability and growth problems are common with this type of fracture because of the disurption of both the metaphysis and epiphysis. Surgical intervention is common in order to re-align the bones correctly. 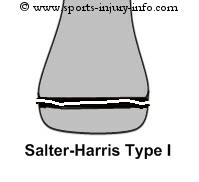 A Salter Harris V is a crushing type of injury where the epiphysis and metaphysis are forced together, crushing the growth plate. Imagine smashing your Oreo cookie. There is significant disruption of the epiphyseal plate and growth problems can be severe with this type of injury. Growth plate fractures can be a serious injury depending on the type of fracture. Types I and II are the least likely to have long term growth problems or require surgical intervention. Types III, IV, and V are more likely to cause growth related issues, or require surgery. With any type of fracture, it is important to follow your physician's instructions and make sure that your injury is treated correctly.